Cardijn Community International (CCI) was formally launched in Hyderabad, the capital of Andhra Pradesh in India on the 19th February 2012. Around 50 former leaders and animators of YCS, YCW and CWM participated in the one day launch program which started with a holy mass by Fr. Thumma Arla, a former animator of YCS and the present Director of the Diocesan Pastoral Centre. The Diocesan President of CWM and the Diocesan Youth Director, Fr. Fatima Reddy also attended. Ms Elizabeth Martin, a former YCW and Organising Secretary of the meet welcomed the gathering and introduced the CCI National Leaders and the International Secretary General. Fr. Thumma Arla assured his support in the efforts to promote Cardijn. He emphasized the need to ‘See-Judge-Act’ in the light of the Gospel values. Fr. Thumma appealed to the CCI to help him re-activate the Pastoral Centre and put it to proper use and expressed that CCI is always welcome to make use of the Centre. M. J. Ruben, CCI Secretary General congratulated the Hyderabad Chapter for the launch. In his brief intervention he covered on the origin and objective of CCI and gave a overview of the functioning of the movement at the international level. He also introduced the Vatican II + 50 project. All the former leaders were very excited to meet each other after 20 to 30 years and they were very jubilant that such an opportunity was created by CCI. Each one came with photographs of the past, certificates, etc. Mr. Antony, a former YCS leader showed his appointment letter as a full timer on a salary of Rs.200/- per month. 35 members enthusiastically attended the post lunch planning session and continued their testimonies. At the concluding session, James Sylvester proposed the formation of an ad-hoc team to work out modalities for regular meetings, activities, etc. and it was agreed upon. After consultation in small groups, a coordination team was nominated for CCI-Hyderabad with Ms Elizabeth Martin as the Coordinator. An appeal was made to those who would like to be part of the team to contact the Coordinator and to take part in the next meeting. The grand launch program preceded hectic preparations and contact work done by James Sylvester, Martin Michael and Ms Elizabeth Martin. CCI International Team met for their first meeting after the General Assembly in Bangkok last July. 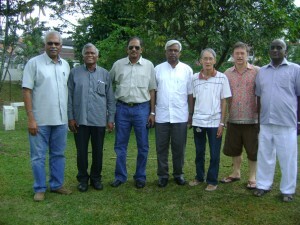 The meeting was held at La Salle Hall, Petaling Jaya, Malaysia from the 17th to 19th January 2012. The IT adopted a 'Minimum Guiding Principles' document as a reference document for the movement. One of the important decisions by the IT is about the project 'Vatican II + 50 - A Cardijn Perspective'which will be launched in a Conference to be held in Manila, The Philippines from the 11th (evening) to the 14th October 2012. CCI Philippines have already started the process of preparation for the October conference with the launch of a financial drive. As part of the 3 year project, an Inquiry Campaign will be launched in the next few weeks to ascertain the views and experiences of the laity on the spirit and decisions of Vatican II with particular reference to the social teachings and lay participation. Priority countries for extension in 2012 will be: Thailand, Singapore, Indonesia and Vietnam. CCI-India wishes the International Team all the best in their endeavours!